This map illustrates satellite detected flood water over the flood affected area in the Upper East Region, Ghana and neighbouring regions in Togo and Burkina Faso (depicted in red). 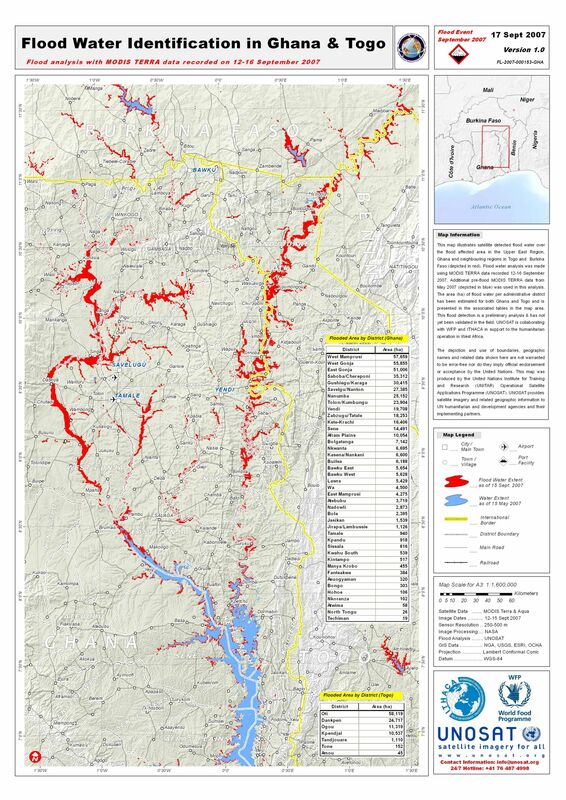 Flood water analysis was made using MODIS TERRA data recorded 12-16 September 2007. Additional pre-flood MODIS TERRA data from May 2007 (depicted in blue) was used in this analysis. The area (ha) of flood water per administrative district has been estimated for both Ghana and Togo and is presented in the associated tables in the map area. This flood detection is a preliminary analysis & has not yet been validated in the field. UNOSAT is collaborating with WFP and ITHACA in support to the humanitarian operation in West Africa.